My family and I just got back from our short spring break ski trip to Colorado, and we had a fantastic time skiing at Mt. Crested Butte. Three days later, we headed back to Denver and spent a night at The Curtis while waiting for our flight back to Texas. If you happen to visit the Mile High City of Denver, I would highly recommend The Curtis Hotel for either business or for pleasure. Located across from the Denver Center for Performing Arts and just blocks from the bustling 16th Street Mall, The Curtis — a Doubletree by Hilton is the place to “Stay Happy” in the downtown Theater District. There are more than 40 restaurants within five blocks of the hotel and plenty of shopping and entertainment to keep guests busy. The award-winning Curtis is also convenient to Denver’s eight professional sports teams, world-class zoo, the Denver Art Museum and History Colorado. Inside, the lobby sets a playful pace, with bold contemporary features and furnishings in a retro palette. There is interactive video art of classic childhood games by local artist Gary Emrich. The Five & Dime store brims with treats from the past serving classic sodas, candies and travel games as well as signature Curtis amenities. And behind the front desk are talented staffers whose impressive knowledge of “rock, paper, scissors” assures the check-in process will put a smile on each guest’s face. The ground-floor frivolity is just a prelude to the playfulness above, which encourages guests to “Stay Happy” when they stay at The Curtis. Upon arrival guests will get to enjoy their signature chocolate chip cookie. You can feel that this welcoming gift is only a taste of the warm, personal service you will experience at DoubleTree by Hilton. With 16 stories to go around, The Curtis features 13 themed guest room floors – including a mysterious 13th Floor – each with eye-catching pop art inspirations and installations. The themed floors include: Perfect Pair Floor, One Hit Wonder Floor, Fun & Games Floor, Sci-Fi Floor (the pet friendly floor), Big Hair Floor, Floor of Champions, Chick Flick Floor, Dance Floor, Dun Dun Dunnnnn!, TV Mania Floor, Mad About Music Floor and Pedal To The Metal. We stayed on the 15th floor which was themed with Mad About Music Floor, the Jimmy Buffet room. This whimsical room is chic, contemporary and decorated with bold attention to detail. It's decorated with modern furnishings and eclectic pop art décor. My daughter was very fascinated with this giant Margaritaville mural on the wall. Each guest room amenities include a flat-screen television, Beetle Speaker System with ZipConnect for iPods and MP3, complimentary high speed wired and wireless internet access, iron and ironing board, coffee maker and coffee, and HHonors points for Hilton members. Not to mention, on-site guests have access to a Precor-equipped fitness center, valet and self parking, and in-room dining. The Curtis also has 20,000 square feet of flexible meeting and banquet facilities, including two ballrooms, state-of-the-art A/V equipment, and a business center to cover all your business travel needs. Bathrooms are supplied with Tarocco from Baronessa Cali bath products and amenities that have a lovely fresh orange scent. The bed was super comfortable, the room was immaculately clean, and inviting. Our experience during our stay was beyond our expectation. The Curtis also offered us a complimentary welcome tray for a couple of times and personalized notes. That was really sweet of them! We can't explain how charmed we were with this hotel! It's quaint, eclectic, unique, and a hotel like no other. The service was impeccable, staff did an outstanding job and the accommodation was excellent. My family and I would highly recommend this place to everyone! So why not come and play at the Curtis – a DoubleTree by Hilton! 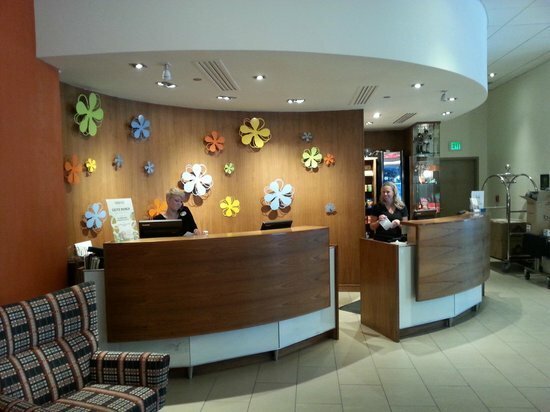 They guarantee a completely humorous and modern hotel experience in downtown Denver. Rest your bones. Stretch your smile muscles. Stay at The Curtis. And always Stay Happy. For more details or would like to book a room, you should visit thecurtis.com today! Don't forget to like them on Facebook or follow them on Twitter for updates and promotions. Disclosure: I received a one night complimentary accommodation for my family to stay at the Curtis Hotel, a DoubleTree by Hilton Hotel in exchange for a fair review. That would be such a great place to visit as a family. I'm fascinated by that wall mural myself. I would love to go!! Great post! I'd love to have a look through all of those floors. You guys really lucked out with your Jimmy Buffet theme! Looks like such a great place to stay and so much to do! That looks like a really nice hotel. I haven't been to Denver, except passing through. I haven't heard of this hotel before! Looks like a really lovely place to stay! I have stayed at a Doubletree before. Very nice hotel chain! What a spectacular place.I will remember this. I've been curious about Doubletree. I was looking at one elsewhere and on the fence. Now I'll know they're stellar properties to book! This looks so unique and original all while being super comfortable. Love it! I love the very modern look to this place! Thanks for sharing! This looks like a very nice well kept hotel. I think the theming is really neat. Your pictures look awesome, and having a chocolate chip cookie on arrival sounds great. Sounds like you had a great time. And I have to say, I am really impressed by the look of that hotel. NICE. Looks like a great place! I love the themed floors! I've stayed in Doubletree hotels many times, but I've never seen something so neat as themes in design by floor. Cool! I'm sure it was full of fun. The lobby sets are so beautiful. I wish I could visit this place one day. What a fun hotel! I love all of the little details! I haven't stayed at a doubletree in a while, but will be in Denver next year! Wow! What a fun hotel..channeling Jimmy Buffet is awesome! I love the fun and decor. Now, I want to go to Denver! I am lovin' the décor of those rooms…so inviting for a hotel stay. The complimentary welcome tray and chocolate chip cookie definitely got my attention too. WE've stayed in DoubleTree hotels a number of times, but I don't recall them ever looking like that. And no cookies either! That looks like an amazing place to stay! I must say, I LOVE Hilton. They never disappoint! Hokey smokes that's a lot of restaurants in the area to choose from, and hurrah for it. This is my second time hearing of this chain this week. My interest is def. piqued and we are in the midst of planning our summer vacay! Galing galing mo talaga sis! This looks like a very family-friendly hotel. Never been to Colorado before, parang ang ganda! That's a very nice hotel, so child friendly! What a beautiful hotel this is Mommy D. It is a perfect place to relax while enjoying your vacation. I would love to see your skiing photos. It looks like your family had a blast. what a nice hotel and love that cookie! this would be perfect for a staycation! Curtis' themed guest rooms are quite interesting! I'd love to spend a night or two here with my loved ones.